DELMARVA– On Monday morning many across the east coast were awoken to tornado warnings in their area. Those affected by the warnings included Dorchester, Somerset, Wicomico, Worcester, Queen Anne’s, Caroline, Sussex and Kent Counties, with tornado watches following in surrounding areas. 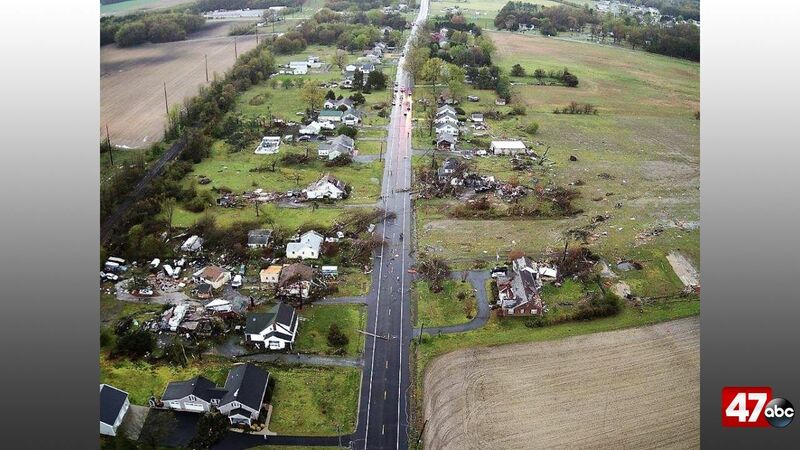 Delaware Electric Cooperative is reporting several outages and are now discovering what appears to be possible tornado damage along Rt.20 and Baker Mill Road near Seaford. So far, they have restored power to 2,400 members. Meanwhile in Laurel, crews are working to fix broken poles and have restored power to 1500 homes so far. The Laurel School District is officially closed Monday April 15th due to severe damage in the community. Delmarva Power, Choptank Electric Cooperative and A&N Electric Cooperative are all currently working to restore power to those affected across the Peninsula. Stay tuned to 47 ABC for the latest on storm damage.